Host hopping or LUN exchange -- two interesting approaches to moving virtual machines. For VMware Infrastructure 3 administrators, moving virtual machines across hosts is not an issue at all. In fact, that's one of the better selling points for the solution. 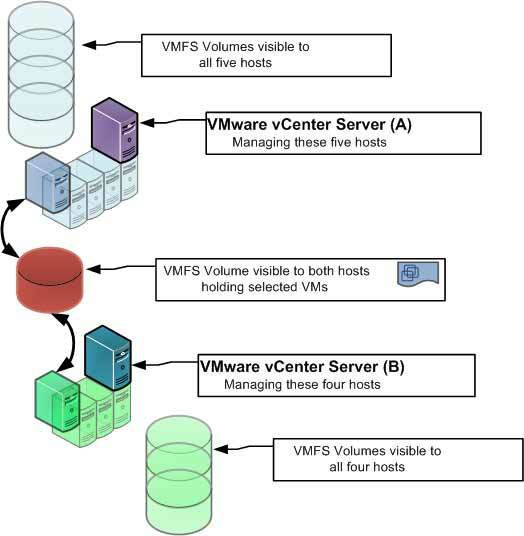 But what about moving VMs from a host on one vCenter to a host managed by another vCenter? This is the most straight-forward approach and can be done without taking the VMs down. Simply populate a host with the VMs that you want to move from the first vCenter to the second and do a disconnect task of the host. You'll need to do some prep work ahead of time by provisioning the host that will go between vCenter systems to have connectivity to both storage systems so that once the VMs arrive, they can be moved to their final destination via Storage VMotion. 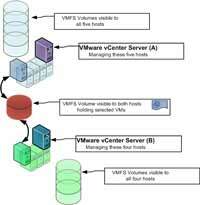 The original host can then be returned to the original vCenter server when the VMs have been moved off. While host hopping can be used in most situations, not everyone has a host to spare or licenses to accommodate extra CPUs arriving within vCenter. If you can spare the VM being shut down for just a moment (about a minute), you can move the VM to another vCenter system through a process I call LUN exchange. This is basically a LUN provisioned to multiple hosts that are managed by multiple vCenter systems. Ideally you would have one VMFS volume on a LUN that is visible through the storage system to a designated host on each vCenter environment. The key to this working is the VMFS file system and the inventoried owner of the VM within vCenter. Fig. 1 shows the process. Once the guest is placed on the transfer LUN, you shut it down and remove it from the first vCenter server's inventory. Then on the other vCenter server, browse that LUN and import the VMX file to add it to that management space. At that point the VM is clear to turn back on. You'll want to test this configuration on your storage systems before trying to go this route, supported features vary by ESX version across disk products. There you have it, two tricks to move VMs between vCenter systems. There surely are plenty more ways to go about the task. E-mail me with yours or share it in the comments section.